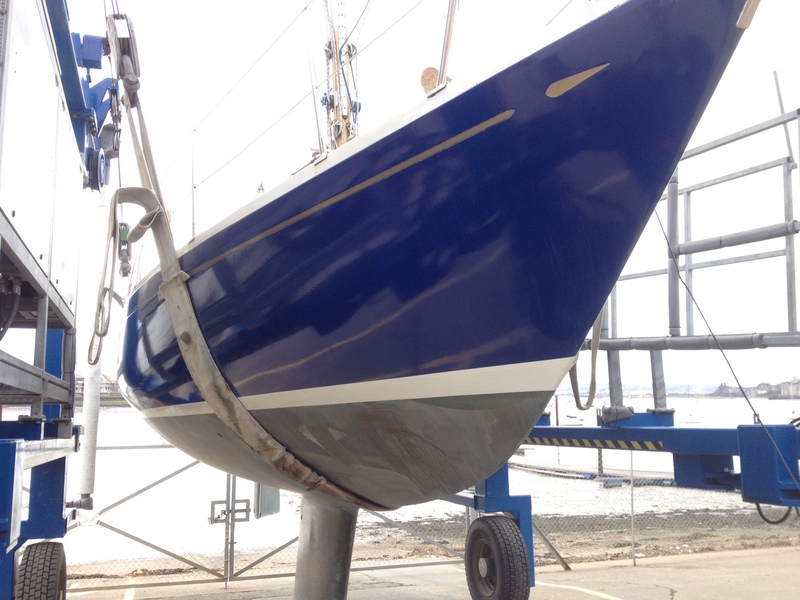 Triola’s gelcoat is still the original 1970s coating, and being the pretty dark blue of the earlier boats, has been subjected to significant degradation over her life from UV exposure. I looked into getting a respray done, however the total cost would have run into many thousands and was a cost I couldn’t justify. In addition to this, I was painfully aware that once you have painted your boat, you are forever on the treadmill of patching it up. I briefly looked at painting the boat by hand, however quickly discounted this option due to the often variable results. The gel coat was so degraded that no amount of wax or polish would keep her looking shiny for long, in a matter of weeks the gelcoat would turn chalky and start to look embarrassingly shoddy. Use TL Sea (sold by the same chaps) to remove any UV bloom and chalkiness using a white Scotchbrite. I had to go around the boat three or four times doing this to remove all the stains. Use Poli Prep using another white scotchbrite to wash any TL Sea off as well as any oils or stains that might give the Poliglow any trouble. One final wash with water to make sure all chemicals have been removed. Once you have a ‘warm’ day (these do exist in the UK, very occasionally) of above 12 degrees, you can apply the Poliglow. It is ‘smeared’ on using the applicator supplied with the kit in six coats applied one after the other going continuously around the boat. 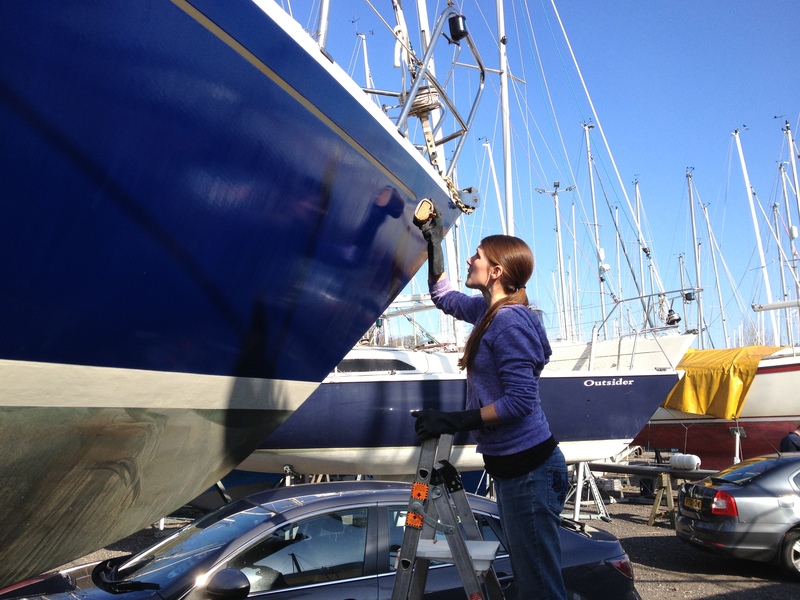 The first few coats will be streaky whilst your hungry gelcoat absorbs the Poliglow, and then after this, you will find it a most satisfying process as you could find on your boat, each coat making the boat shine a little bit brighter. Once this process is complete, leave to dry for a couple of days, pray it doesn’t rain in the following 24 hours (it rained just after application one year and that was a disaster – a very streaky, flaky boat all year), and presto, you have your beautifully Poliglowed boat. Be warned though, on our dark blue gel coat, it will only last four months or so before it needs a ‘top up’. This just involves finding a quiet anchorage and applying an additional coat on a warm and calm day. We plan to do this twice this season, and pray it lasts.